Genetic Genocide: Annihilating Entire Races of People - The Prophetic Future of the World! 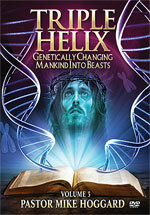 Title: Genetic Genocide: Annihilating Entire Races of People - The Prophetic Future of the World! Did you know that Fallen Angels have their own DNA? Research is also going forward to make human DNA into a viral substance so humans can be implanted through VACCINATIONS!! 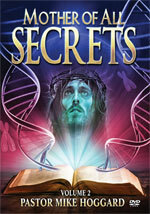 ""DNA - Mother of All Secrets"
""Triple Helix: Genetically Changing Mankind Into Beasts"
Jesus stated that deadly and devastating plagues would ravage mankind as part of His judgments at the End of the Age, during the time of the Antichrist. I have always found it disturbing that Jesus is predicting that this End of the Age plague would be especially devastating and deadly. In other words, this final plague would differ from other plagues which have devastated mankind in the past by the severity of its killing power. Please keep in mind the Biblical association which Jesus makes with this Fourth Seal, with Death and with the realm of the dead (Hades), for we shall soon view one of the most disturbing pictures of Death and the realm of the Dead later in this article. Also keep in mind the strange portion of the prophetic Scripture above, which foretells, "with plague (pestilence, disease) and with wild beasts of the earth." 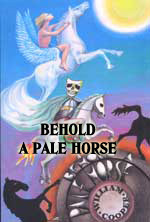 As we shall soon show, the "Wild beasts of the earth" are truly a part of the prophesied plague. In fact, we shall show that the plagues currently being touted as potential killers of billions of people are genetically engineered and are literally formed in part by "wild beasts of the earth"! In summary, Jesus Himself warns that one of the judgments which He shall cause to rain down upon the earth at the End of the Age, during the reign of Antichrist, will be deadly and devastating plagues - diseases for which there is no cure. Now, let us examine the parallel Illuminati Plan for just such diseases. "Increase the death rate" is the clarion call of the Illuminati! Both these Illuminati quotes promise that the death which will occur to masses of people will be "benevolent"! While we recoil at the idea that any murder can be "benevolent", we think with the mind of Jesus Christ, not Lucifer. The Devil hates all mankind and wants them all dead -- including those who serve him loyally -- because all mankind is "made in the image of God"! As we begin our study of the planned "Genetic Genocide" of specific races of people, we need to keep in mind that the Illuminati Plan to eliminate over 4 billion people in a very short timeframe is the fulfillment of Biblical prophecy. Once we comprehend this reality, we shall be in a better position to face this new reality with courage and the calmness of knowing that our Lord and Savior is in firm, complete control of every event. 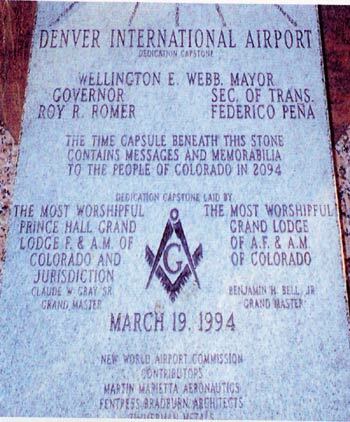 The new Denver International Airport was built through Masonic effort and was dedicated March 19, 1994, as the "New World Airport"! Notice that this date contains three (3) nine's -- a 999. The Number 9 to the Illuminized Freemason is a number denoting finality, the absolute end of something. Furthermore, in the area of occult numerics, the meaning of a number can be intensified by it being shown twice or three times. Three is the maximum number of intensification possible in this area of occult numerics. Therefore a '999' represents a triplication of the meaning of finality and the maximum intensification possible. Evidently, the Masons intended the Denver Airport to represent something very special in the progress toward their coveted New World Order, i.e., a global economy, global dictatorship and a global religion, to be ruled by their global Masonic Christ. This is the Plan. Does the Denver Airport possess something unique that no other airport possesses? Further, does the Denver Airport contain something uniquely New World Order? You bet it does, for it contains a series of murals along the two interconnected halls in the main terminal building. If anyone who knows the New Age plan for the world and who knows occult symbolism studies these murals, that person will realize that the horrific genocidal plans of the Illuminati are graphically portrayed along these walls. I took pictures of these murals several years ago while traveling through Denver on my way back home on the East Coast. Let us now examine the first mural in our study. We selected this one to report first since it dramatically shows the kind of annihilation planned for certain races of human beings; further, it graphically portrays the heartless Nazi soul of the Global Masonic Elite which has created this Satanic plan and which is steadily advancing it throughout the entire world. The most striking part of this painting is a Nazi-type soldier wearing a gas mask and carrying a submachine gun etherically flying over a devastated world. But, the most startling feature of this painting is that this Nazi storm trooper is carrying a "huge sword"! Does this fact bring an Antichrist prophecy to mind? ""Take control of the world ... to reduce ... the world to a safe level by a process of benevolent slavery and genocide ..."
When this Nazi-type world genocide begins, the Illumiinati will consider the millions upon millions of deaths to be a "benevolent genocide"! Finally, notice that this Nazi storm trooper has speared the white dove of Peace. Thus, this mural depicts exactly what this Revelation passage foretells, i.e., the rider of the Red Horse shall "take the peace from the earth"! 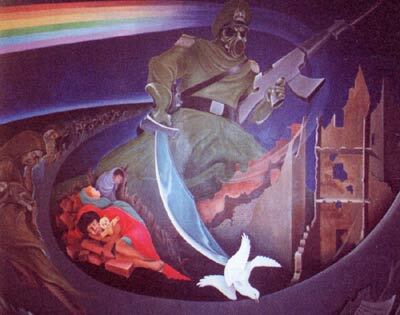 While the white dove of Peace is murdered, the rainbow stretching in the wake of the Nazi soldier is the New Age Rainbow, depicting that the Christian Dove is dead and is replaced by the occult peace which will envelop the Earth. 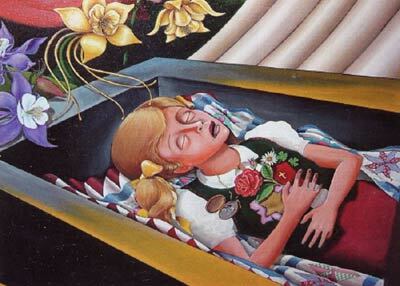 Notice that the dead people contains the dead of the black, Hispanic and white populations. All these horrific murals depict children, not adults, because children are widely recognized as the future of the planet. If you kill children, you are killing the future of Mother Earth. And, this is exactly the message this mural is screaming to all who will listen. Of course, adults die also, but the key is that, for certain types of people, this destruction marks the end of their civilization! To learn more about the races selected for extinction, let us now review the "Extinct Species" mural. The first fact which jumps out at you is that the entire world behind the children is on fire; but, it is not just a small fire, it is a conflagration. All of the world visible in this scene is violently on fire. However, it is Nature that is burning, not modern buildings of the present Industrial Age. New Age teaching adamantly states that our "present civilization has to die", because it is poisoning Mother Earth and polluting her air, her streams and her oceans. To correct this problem, Mother Nature sends storms and/or natural disasters to eradicate the evils which are slowly killing her. This fire would be a perfect artistic way in which to express this type of destruction which Mother Nature is wreaking upon the Earth. The movie, "The Day After Tomorrow", expresses this concept that, if man does not act in time to prevent the slow destruction of Earth, Mother Nature will wreak such havoc upon this civilization that the pressures which were destroying the Earth are relieved. Now, let us examine the animal species which are extinct. Shown are the American Buffalo, the sea turtle, the whale and other unidentified animals. Once again, New Age adherents hold that our current civilization is literally destroying animal species at an alarming rate. However, the real shock in this Extinct Species painting is that three human beings are lying in coffins in the forefront of the picture! What does this represent? Are some human races going to become extinct? You bet they are! The Illuminati plans for several races and/or religious groups of people will be completely annihilated, wiped from the face of the Earth. Let us now examine these three extinct human beings with pictures which are a little clearer. 1) African Blacks -- this woman is identifiied as an African black because of the headdress and the clothes she is wearing. 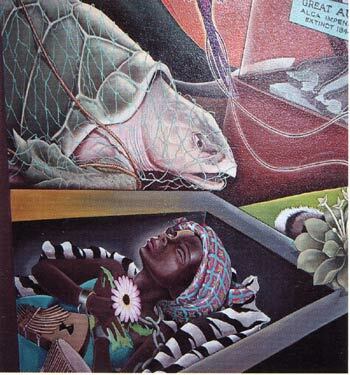 The netted sea turtle shown above this coffin is an ancient African symbol of spirituality. While some blacks will survive this first round of genocide, blacks from the entire continent of Africa are slated for annihilation. Why does the Illuminati feel this way about African blacks? First, the entire African economy is so crude and so unsophisticated that it cannot meld into the planned cash-free society which the Illuminati plans for the entire world and which the prophecy of Revelation 13:16-18 demands. Can you imagine the economy ever being able to accept the "Mark of the Beast" economic system, where no one can buy or sell unless they had an electronic chip implanted in either their right hand or forehead? Therefore, the Illuminati has branded this type of society the "Non-Functioning Gap" and they plan to annihilate them (Read full details in NEWS1833). Secondly, Africans have traditionally practiced a very ancient type of Witchcraft which is exceedingly powerful; however, it is different from the Western Witchcraft which the Illuminized Masonic Fraternity practices. 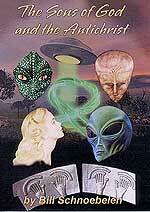 Therefore, the Illuminati plans to eradicate the African type of Witchcraft. Thirdly, most people of non-white skin will be eradicated. The Illuminati plans waves of human race eradication, starting soon after their Masonic Christ arises and continuing for the next 300 years. One Christian researcher was told by a retired American intelligence officer that, 300 years after implementation of the New World Order, only two classes of people will be left alive: a) White European Masters; b) Chinese slaves who will serve the Global Elite. 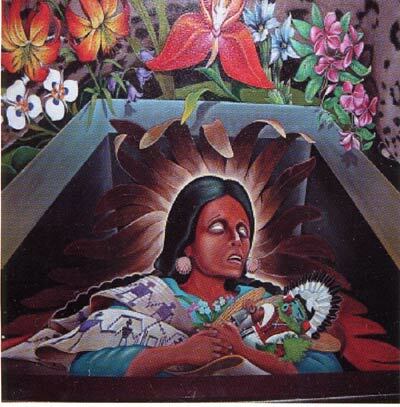 2) American Indian -- Once again, these peoples have traditionally followed a Mother Earth religion, so they are at odds with the more sophisticated type of Witchcraft practised in the West. To make matters worse, the American Indian did not believe that anyone should own any property or land, because the entire Earth belonged to the "Great Spirit". While the Illuminati will not allow Private Property ownership for anyone else, they plan it for themselves. Since this type of property and land ownership is disallowed by the American Indian religion, they will become extinct. But, more importantly, the American Indian possesses a non-white skin. 3) Judeo-Christian white girl -- This blonde-haired beauty lies dead primarily because she is representative of the Judeo-Christian religion. She is clasping three major things in her crossed hands. 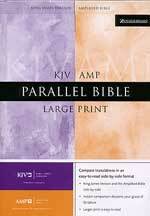 b) Bible with a Christian Cross on it, representiative of Evangelical Christianity. Please note that this cross is most definitely Protestant because Jesus is not hanging from it. Protestant Christianity is targeted for extinction because its adherents so closely follow the Bible that they would never, ever be able to accept the claims of Antichrist. In fact, Constance Cumbey states in her book, "The Hidden Dangers of the Rainbow", that the Illuminati concluded many years ago that they must eradicate all followers of the major monotheistic religions -- Judaism, Christianity, and Islam. Antichrist will practice polytheism and so the monotheist will be automatically opposed to the religion of the Masonic Christ. c) The Rosy Cross -- Rose -- symbolic of the power of Rosicrucianism which is the force of the Illuminati which shall eradicate all Jews and all Christians. 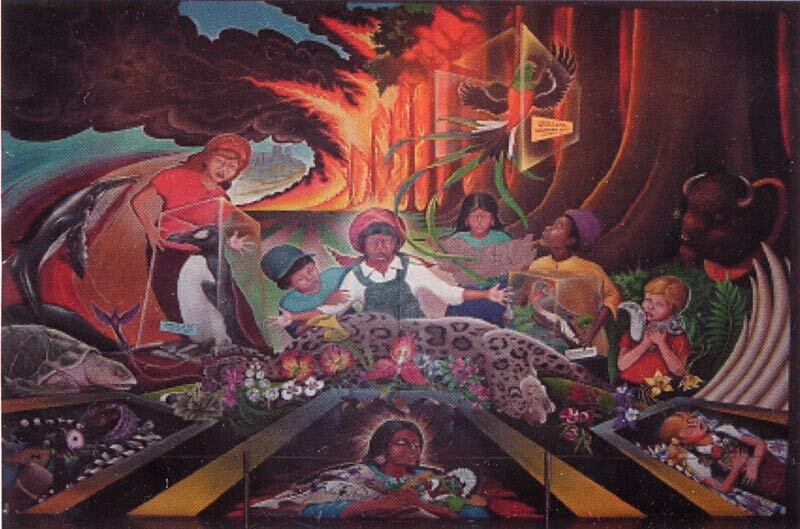 We have seen the plan to eradicate certain races of people in the coming New World Order, as reflected in the murals of the Denver Airport. My earlier research firmly substantiates the plan as set forth in these murals. But, how is the Illuminati going to be able to destroy only certain races of people? 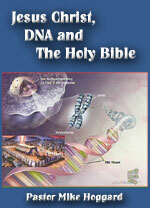 The answer is geneticly created diseases which can kill certain ethnic groups while sparing others. What did Defense Secretary William Cohen say again, in 1997? And, all these viruses contain genetic materials of other animals, quite possibly fulfillment of the prophecy that the plague of Seal #4 will contain "wild animals of the earth". I remember well the horror I felt in late, 1997, when I was reading the Attleboro Sun Chronicle during breakfast. Hidden away deep within the first section was a short article which reported that Israeli scientists were forced to admit that they were researching a plague which would kill their Arab enemies but would not harm any Israelites! I felt a hideous crawling sensation all over my body for a few seconds while I contemplated the horrors of such a genetically specific disease. I had already read the Illuminati Plan to destroy certain "devalued" races, and suddenly, I knew how the Global Elite was going to be able to pull it off! These are the most dangerous times in world history to be alive. If you are not a Born Again Christian, you have every reason to be absolutely terrified. Once the Illuminati decides to "pull the plug" on our present civilization, they will impose an Absolute Dictatorship in every country on Earth, so quickly that no one will be able to escape and no one will have the time to use their stores of food and water and essential supplies. And, certainly noone will be able to use their survival seeds! Hundreds of thousands of dissidents will be swept up within hours as Martial Law will be imposed tightly all across every nation on earth. World War III will have begun and the entire Earth will seem to be consumed with the fires of global war. Are you spiritually ready? Is your family? Are you adequately protecting your loved ones? This is the reason for this ministry, to enable you to first understand the peril facing you, and then help you develop strategies to warn and protect your loved ones. Once you have been thoroughly trained, you can also use your knowledge as a means to open the door of discussion with an unsaved person. I have been able to use it many times, and have seen people come to Jesus Christ as a result. These perilous times are also a time when we can reach many souls for Jesus Christ, making an eternal difference.